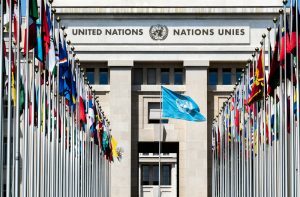 The U.S. announced on June 19 that it was withdrawing from the UNHRC. On June 19, 2018 the U.S. announced its withdrawal from the U.N. Human Rights Council (UNHRC). The controversial move sparked immediate backlash from leaders both domestic and abroad. U.N. High Commissioner for Human Rights Zeid Ra’ad al-Hussein called the decision “disappointing,” though he also said that it wasn’t entirely unexpected. The UNHRC was es tablished on March 15, 2006 by the United Nations General Assembly. Its purpose is to promote and protect human rights around the world and to address any violations thereof. It has 47 members who are elected for staggered three-year terms. But not everyone saw the move in a negative light. Nikki Haley, U.S. ambassador to the U.N., said that the decision to withdrawal was due to corruption and partisanship that exists within the organization. “For too long, the Human Rights Council has been a protector of human rights abusers and a cesspool of political bias,” Haley said during the announcement.